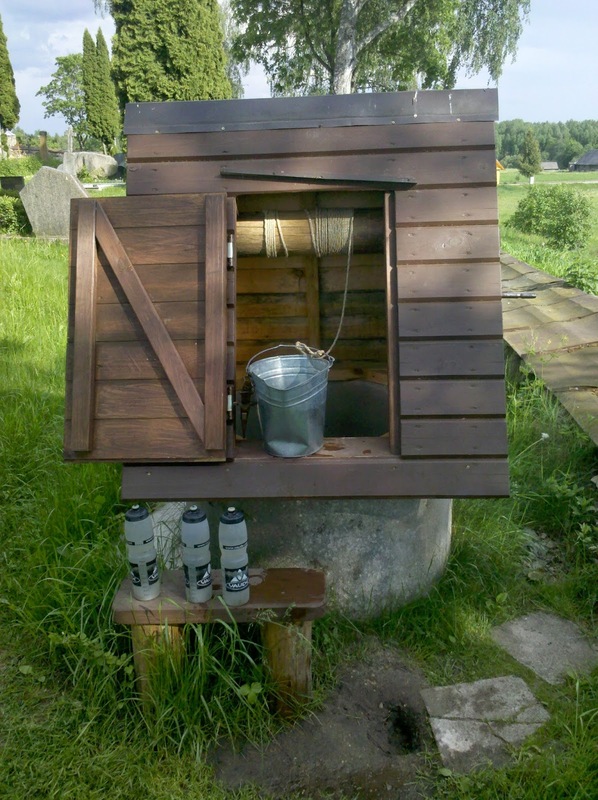 It had already been difficult to find an accessible water tap in Poland but it became downright impossible in Lithuania. All my usual tricks failed: no water taps in cemeteries, gas stations, in gardens or public water fountains - nothing! Even public toilets are "dry". Once I saw a water tap at the side of a house and was immediately spotted by a friendly house wife who called her husband - not to chase me away, but to explain that this tap water was not for drinking. I became so desperate that I started to buy water in 5 litre plastic bottles in supermarkets. They are cheap (only about 0,60 €), but I disliked the idea of creating so much trash. The solution of the water mystery dawned on me when I spotted a well in a church yard. First I thought it was decoration but it had a brand new bucket attached and looked altogether very new. There was even a small metal drinking cup. I tried my luck and got some very nice water. 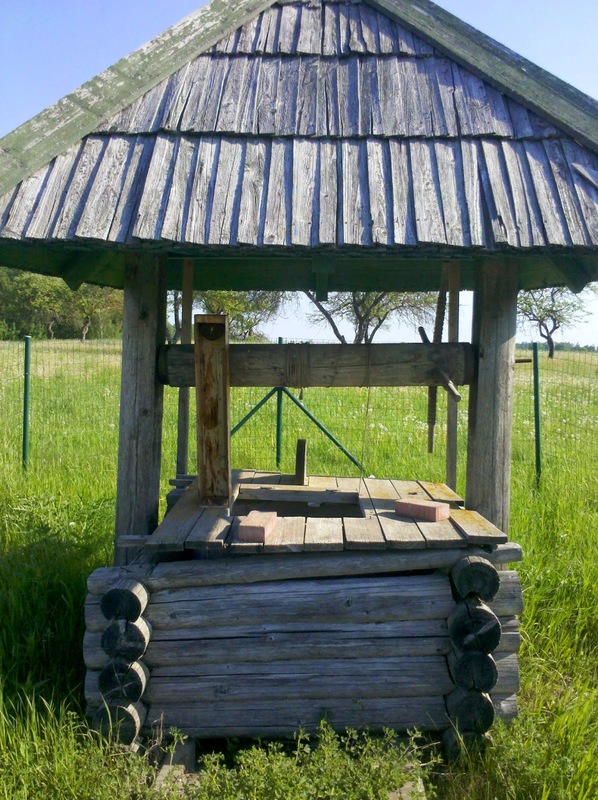 Continuing my trip I now realised that in the countryside almost every house had one of those wells in the garden. 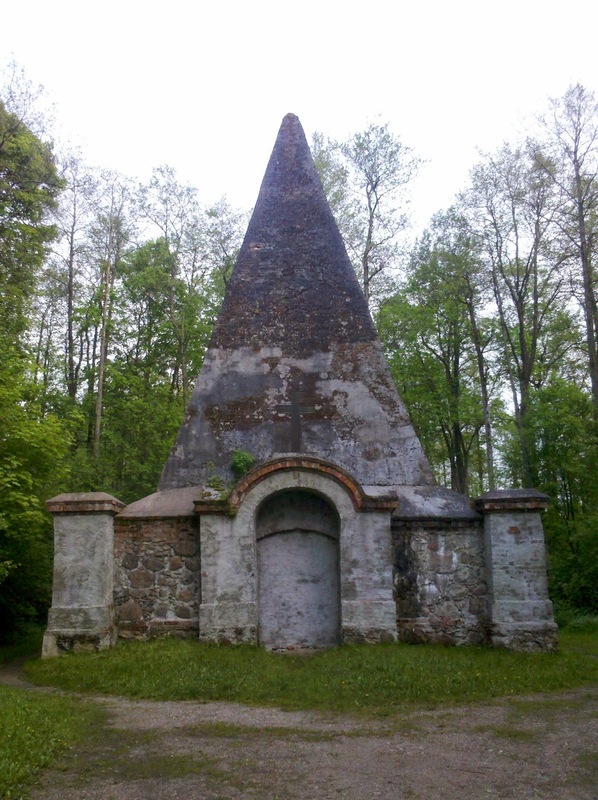 And not only houses - even some cemeteries have wells. I tried not to think too much about the potability of cemetery ground water when I replenished my bottles there. 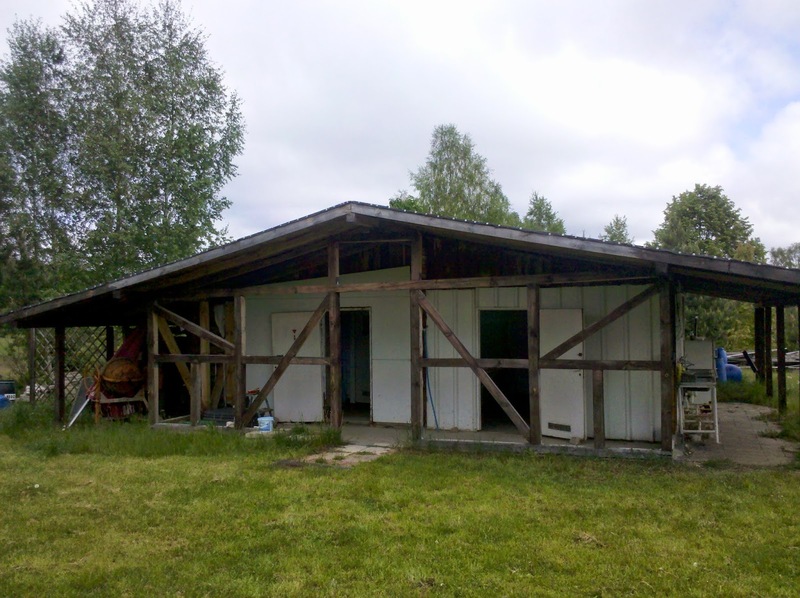 But the problem was solved: Lithuanian villages are not on the grid. There is electricity, but no water system. So here is how to get water: Look for a house with a little well building. It is best when the well looks used, that means when you can see a bucket or plastic containers in front of it. Now very important: check if there is a dog and if it is on a chain. When approaching the house now the dog (and/or the neighbors dog) will start barking frantically which in turn will make the lady of the house appear. Now wave your water bottles, say "water, Wasser, woda" and point at the well. You will easily get permission and now you only have to operate the well. Open the wooden door and hook the bucket onto the chain or rope if it is not already attached. Now lower the bucket into the well. The bucket will have a weight attached at the handle so that it cannot float in the water. Once the bucket has hit the water bring it up again by using the whinge at the side of the well. Now comes the best moment. Take the little water cup and scoop some water out of the bucket to try it: it is deliciously cold and fresh! Leaving Suwalki I was scared to see how many trucks were going my way but luckily I soon turned off onto a quiet secondary road while hundreds of trucks continued on the Via Baltica highway into Lithuania. 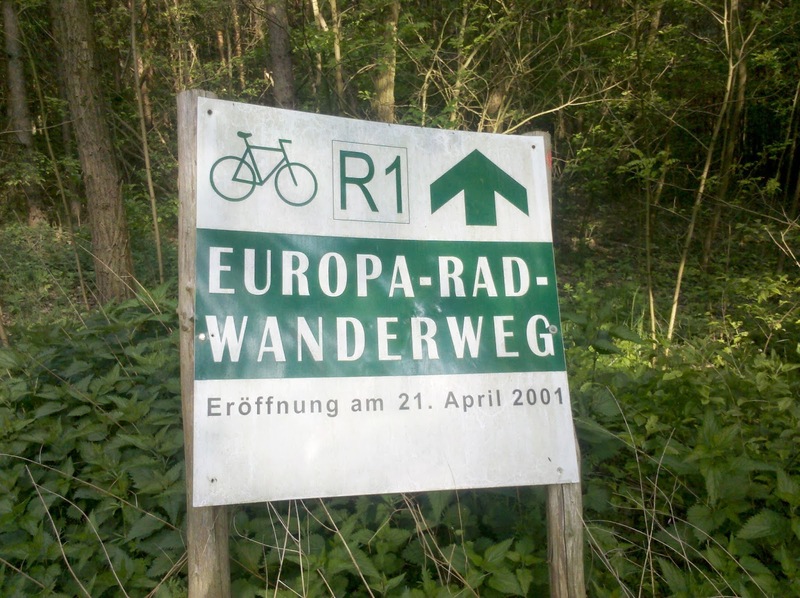 My GPS told me that I was already on the EV (Eurovelo) 11 but unfortunately it showed the wrong route. It led me straight into a forest recreation area where I realised for the hundredth time in my life that mountain biking is not for me. This was a hiking and not a biking trail but because it was such a popular recreation area I did not dare to camp there and pushed on. When I finally reached the real EV 11 route it was great cycling but now I urgently needed a campsite! The happy thought of eating crappy Lidl shushi kept me going until I finally could set up camp at dusk - and eat sushi for dinner in my tent in the Polish forests. 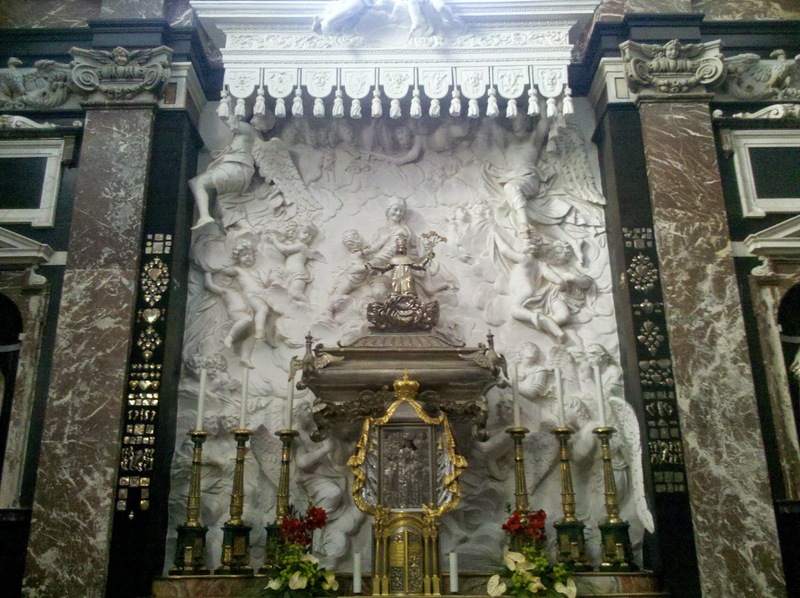 Next day I passed through Sejny which boasts a huge church, another big Polish pilgrimage site on the route of the Camino Polaco. And then, finally, I made it into Lithuania after some more brilliant cycling on the well marked EV 11. This crossing was very quiet with hardly any trucks, in fact with hardly any traffic. As both Poland and Lithuania are Schengen countries I could just cycle through and admire the now defunct customs buildings. And then I made a huge mistake: Because the EV11 had been so nice and well marked I decided to continue on it - and ended up on a dirt trail to hell. All trail marking has disappeared. After 2 km I was fed up and just wanted to bail out to the next paved road. I succeeded with that project only to realise 10 minutes later that this wonderfully paved road turned into dirt as well. At least I made a bit better progress now and had learnt to read my GPS map better. 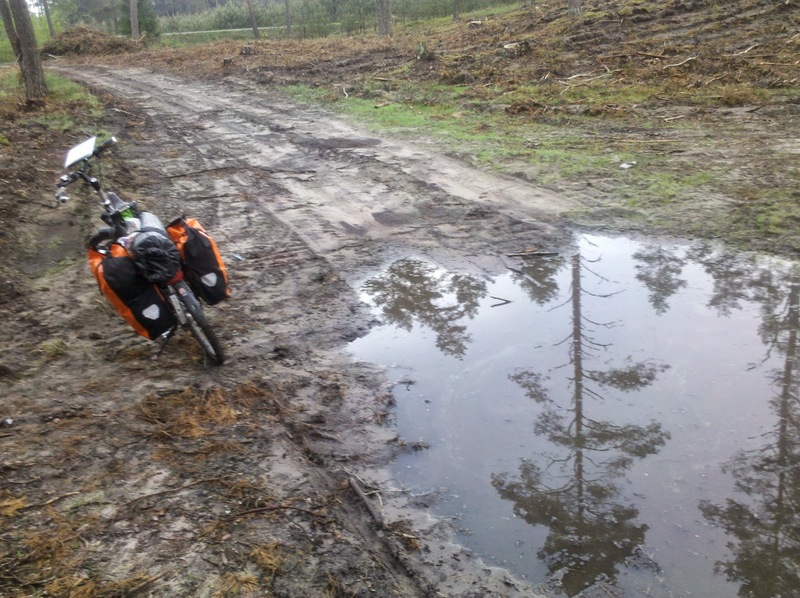 Lesson learnt: Not all roads in Lithuania are paved. 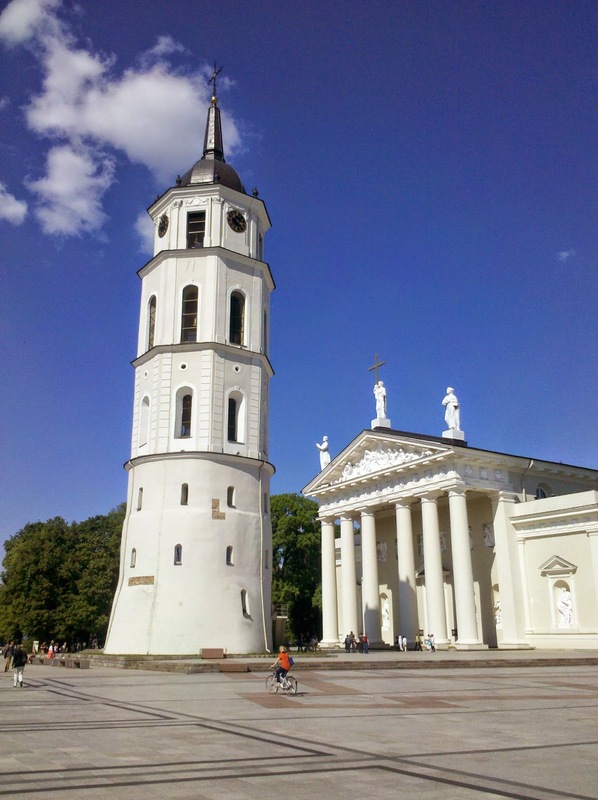 Next day brought me to Druskininkai, a spa town which had a weird feeling. On one side it tried hard to be a mundane luxury spa with posh hotels but on the other side its communist remnants could not be overseen. 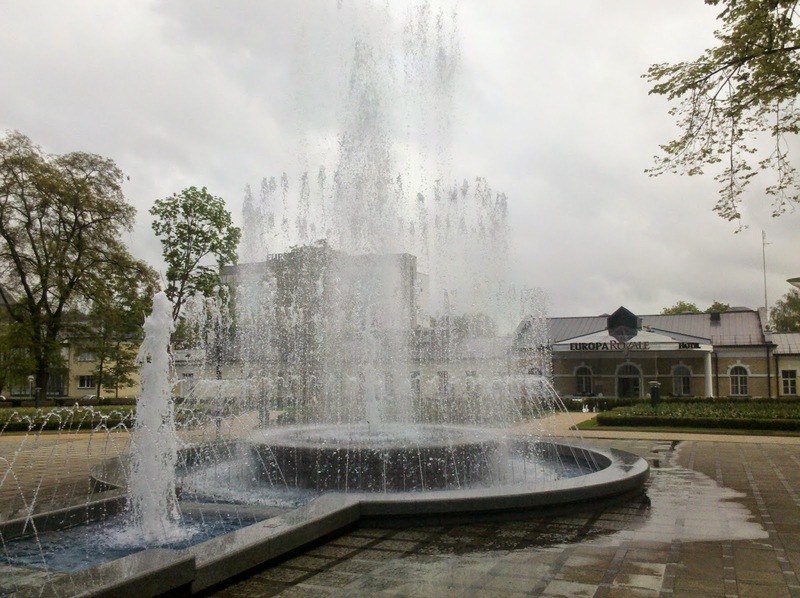 Biggest attraction is a fountain that has hourly choreographed water shows to tacky pop songs which were wildly popular with the mostly Russian tourists. The whole town is sparkling clean and you constantly see workers sweeping the streets or mowing the lawn. I had a very pragmatic problem now: I urgently needed to clean up myself - but where? Plus I needed water and food. Looking for solutions for these problems I came across the public library where I could at least access the internet - after filling out endless forms and showing my ID card. I was now up to date with the news of the world but still dirty, hungry and thirsty. I was just sneaking around the official campground as unobtrusively as possible when some German tourists I had met earlier in town spotted me. Soon almost all my problems were solved. As their "guest" I could use the hot showers and refill my water bottles. I learnt that they were on an organised group campervan tour because it is too dangerous to travel alone in "these" countries. I could not quite share their view but still thanked them profusely. I was so happy being clean again that I had a great supermarket picnic watching another fountain show. Unfortunately once on the road again I had another water fountain show that was not quite that enjoyable: it started to rain heavily. But once the sun came out again I had a beautiful ride through Dzukija National park with endless forests which of course provided perfect camping. My two weeks through Poland showed me again that you need a longer time to really appreciate a country. In the beginning I didn't like Poland at all and only after two weeks when I was already leaving again I started warming up to it. So did I like it? Yes and no. I encountered various problems as a cyclist. The most important one was the state of the roads and the amount of traffic. Both was hit or miss. It was impossible to predict from the map what to expect. Even the R1 was routed over small roads with heavy traffic and potholes. And then in the middle of nowhere you come across a brandnew road with a picture perfect bike path along it. So my biggest piece of advice is to get an up to date bicycle guide for Poland to avoid unpleasant surprises. There is so much road construction going on that things change quickly - and Poland wants to improve its reputation as a cycling destination as I could see from various tourist publications. Also on the negative side were the sightseeing possibilities. So much was destroyed in WW II that there aren't many pittoresque villages left. 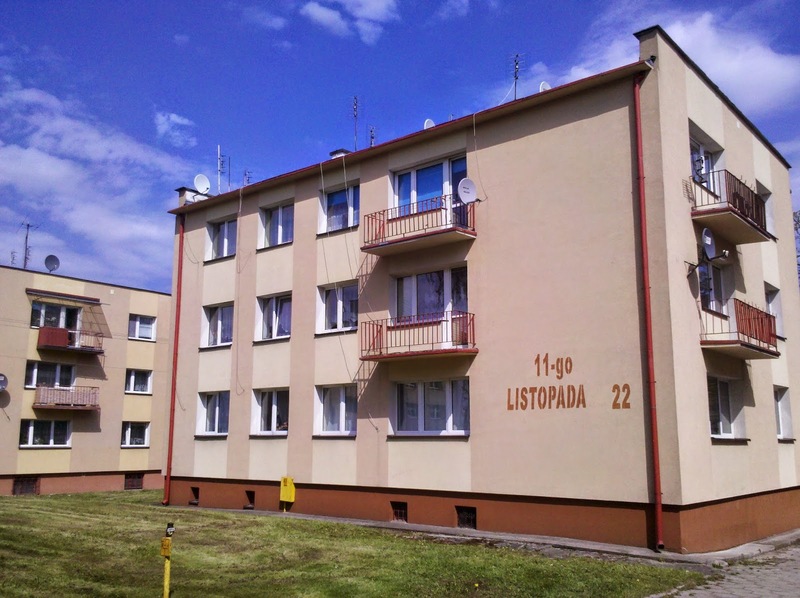 Mostly you will see drab housing complexes - even in the countryside. Towns usually have preserved or rebuilt one or two historical buildings - usually the church - but outside the big touristy destinations the towns don't offer much to write home about either. Keep in mind that I am writing about Northeast Poland. The landscape is not spectacular, but the forests and lakes of Masuria were great. Here cycling was a real pleasure and I can definitely recommend this region for a bike trip. And if you have an interest in history you will even find the villages and towns with its German past fascinating. I found language to be a big obstacle. 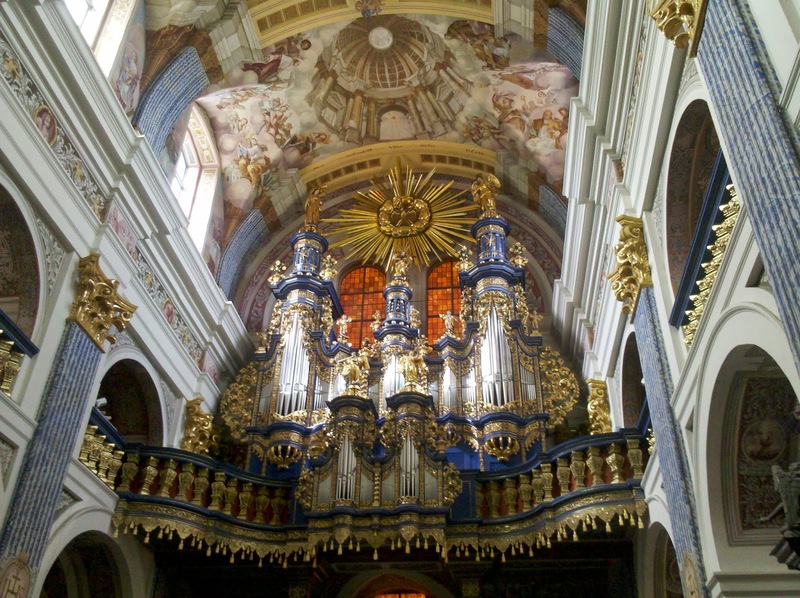 Poland is so big and tourism not important enough that usually everything is in Polish only. This ranges from product descriptions in supermarkets to information boards in museums. You will understand nothing. Sadly enough not many Polish speak a second language - but things are changing. I came across younger people who spoke fluent English - and some older people who still spoke German. But your average supermarket cashier our museum guard will not speak a single word of either language. Finding drinking water was an unexpected problem. My usual strategy of using cemeteries did not work very well. Firstly there aren't that many cemeteries and secondly most don't have water or at least no drinking water. There are no public water fountains whatsoever. Even gas station don't have accessible water taps. So very often I had to ask for water at shops. Despite language problems this never turned out to be a problem. On the positive side resupply is dead easy in Poland. Every little village has its little store - which I did not recognise as shops in the beginning. You can find them by looking for "Sklep" signs - and usually all the village characters are hanging out in front of it. These little shops also sell bread, so don't look for bakeries. Bread and pastries are very cheap and very good, but all imported food is the same price level as in Germany. I loved the Kefir drinks and even liked the famous Polish sausages. Surprisingly enough for such a Catholic country shops are all open on Sunday. You never have to carry many supplies in Poland. 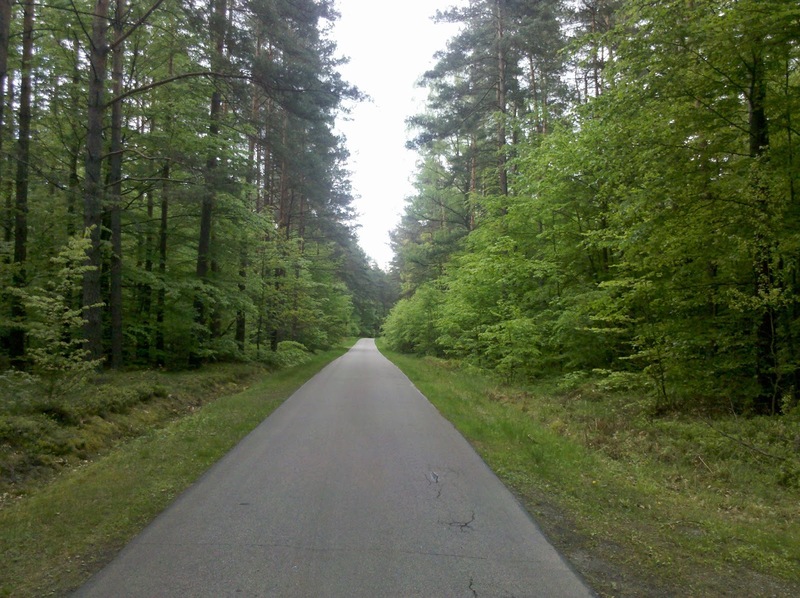 In two week cycling through Poland I did not meet a single other long-distance cyclist - whereas during the one hour stretch of the German Oder-Neisse-Radweg I met several. I was really surprised to be that alone. So would I recommend cycling in Poland to a friend? That depends on the friend. If you are looking for easy and uncomplicated cycling you are better off on one of the official bike trails in Germany. But if you are the more adventurous type and are willing to cope with bad roads and traffic once in a while you will like Poland. 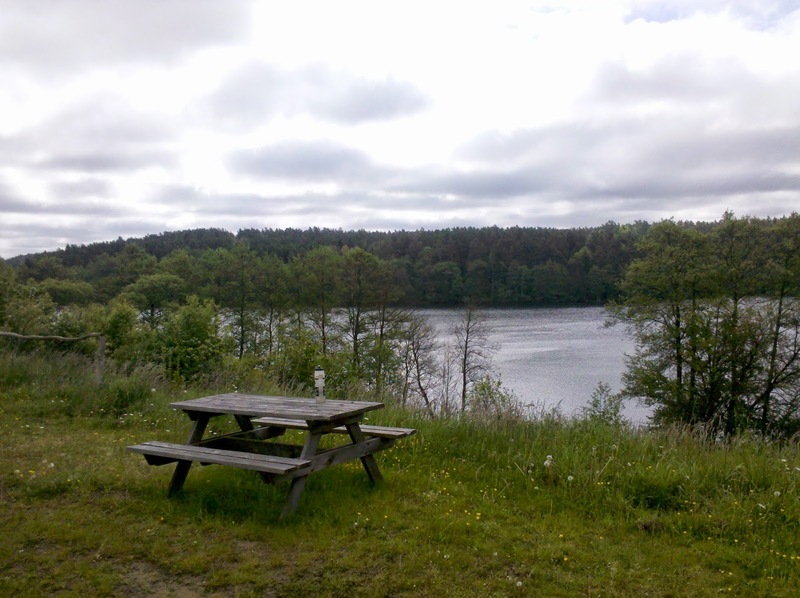 Of course I left the lovely campground late, but I don't have a bench and a table plus a nice lake view every morning. And then I had to pass through Olsztyn again which of course called for a stop to use the free wifi in town. It was way past noon when I finally was in my way - and ended up cycling very late. I found a brilliant campsite hidden in the forest but unfortunately I was not the only one to find it brilliant. I was just sitting down in my tent to eat dinner (steamed brokoly with olive oil and lemon juice plus garlic bread) when something big came thrashing through the undergrowth - a wild pig. I tried the usual clapping to chase it away but it did not help. The huge pig was circling my tent and grunting loudly. Maybe it wanted part of my dinner? Before it could invite itself I resorted to harsher methods: banging my pots loudly finally made the pig run away. But another, totally different sight was on the schedule today: Hitler's headquarter, the Wolf's Lair - the very place where Stauffenberg tried to assassinate Hitler in 1944. 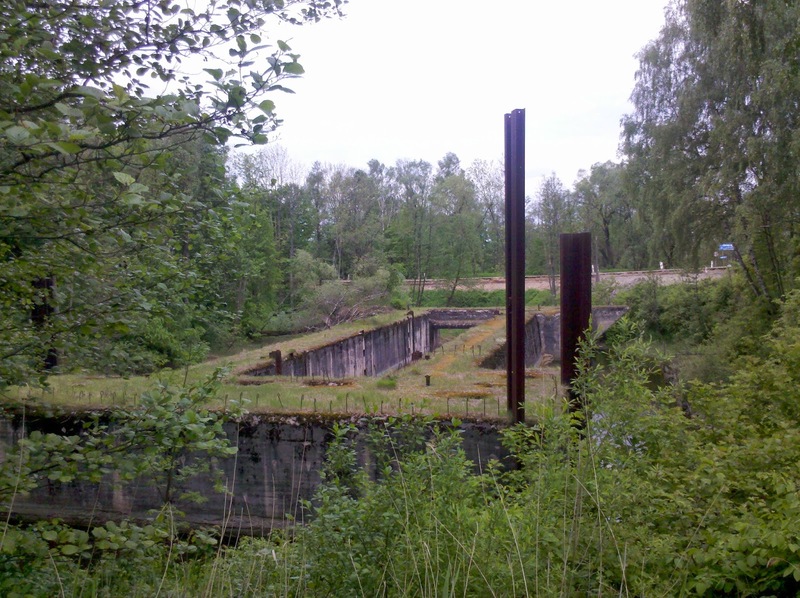 When the Germans had to retreat at the end of the war they tried to blow up the whole complex but the various bunkers were too massive. The whole place had a bizarre feeling now. The buildings are half demolished and mostly overgrown. Huge signs in four languages warn you to go inside because the buildings might collapse but everyone does nonetheless. The old bunkers cover a vast area and a big part has been fenced off by a private company. They charge admission, run a restaurant and hotel in the former officers' mess and even a small campground in the complex. They have created well marked hiking trails - but unfortunately very little historical information is given. Instead you can book Jeep tours or buy souvenirs. As it was raining and off season I had the whole complex almost all to myself which felt even more bizarre. On the pragmatic side I was delighted to see that the toilet complex included a free hot shower - of which I took advantage, of course. After another quiet night in the vast Masurian forests I could have my own little celebration: I had completed my first 1000 km - only about 7000 more to come. I was now cycling along the Russian border but strangely no Russian cars where to be seen. A lot of money is being invested in this area: Roads are being improved complete with picture perfect bike paths. Unfortunately all this construction work comes with one big problem for cyclists: when only one road side is passable traffic is regulated with traffic lights. But the "green" phase is not long enough for a cyclist to race through the construction area so more than once I was suddenly confronted with oncoming traffic and had to rescue myself into the ditch. 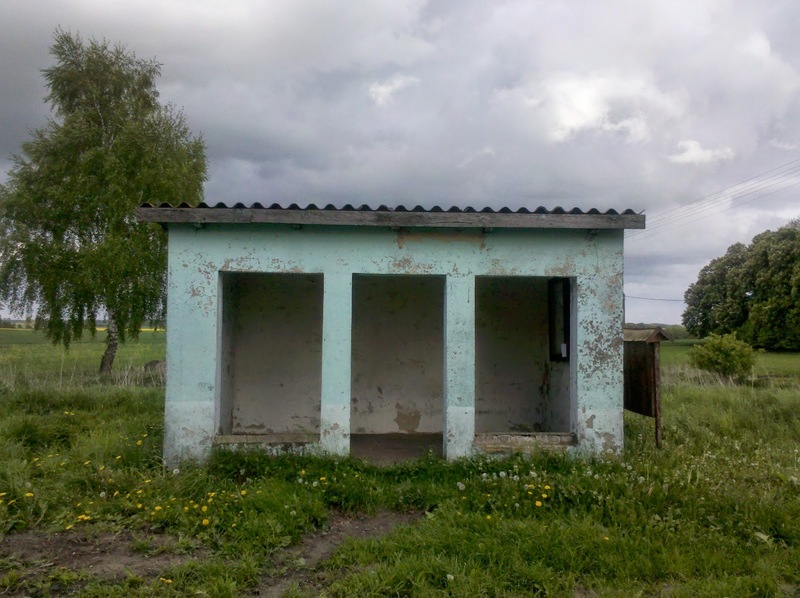 I had expected this region at the Russian border to be poor and neglected but the contrary is true. This is prosperous farmland and a lot of money is invested in improving the infrastructure. I turned off the R1 at the earliest possibility - at Kwidzin. And after a couple of hours of more cycling on busy roads I was suddenly where I had imagined Poland would be. 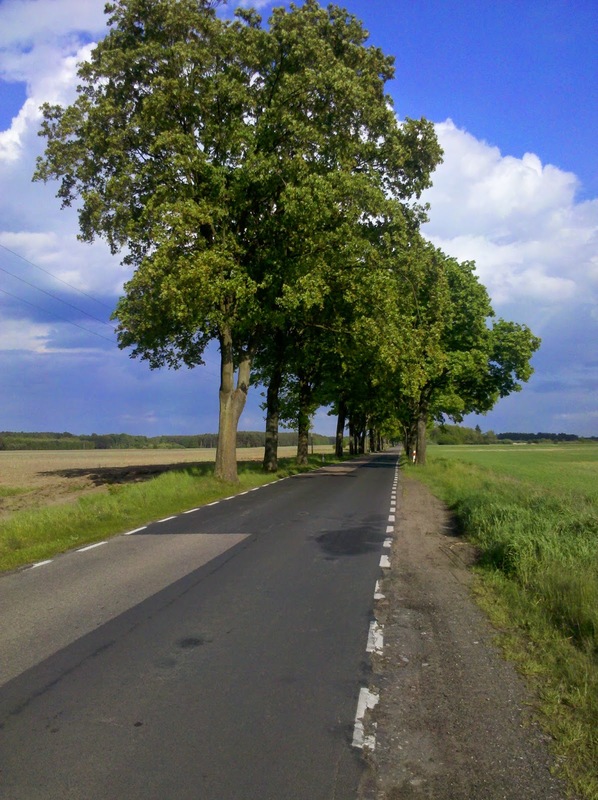 I had now entered the Polish provinces of Warmia and Mazury (former Ermland and Masuren) and here cycling was a pleasure again. I was on small roads with hardly any traffic - only the state of the roads was still bad. But what I liked most was the surroundings: Huge forests dotted with plenty of lakes - which were unfortunately still too cold for swimming but good for a refreshing washing up. Before 1945 this part of Poland belonged to Germany and my cycling guide explained the former German names and history. Some of the villages even had information boards showing old photos of pre-1945. It was interesting to visit the cemeteries (which I had to do anyway to get water): in the modern part it is usually all Polish names but often there is an old overgrown part with German tombstones. The weather - now in May - was still typical April weather. It rained about once per hour for 5 minutes and then the sun came out again. 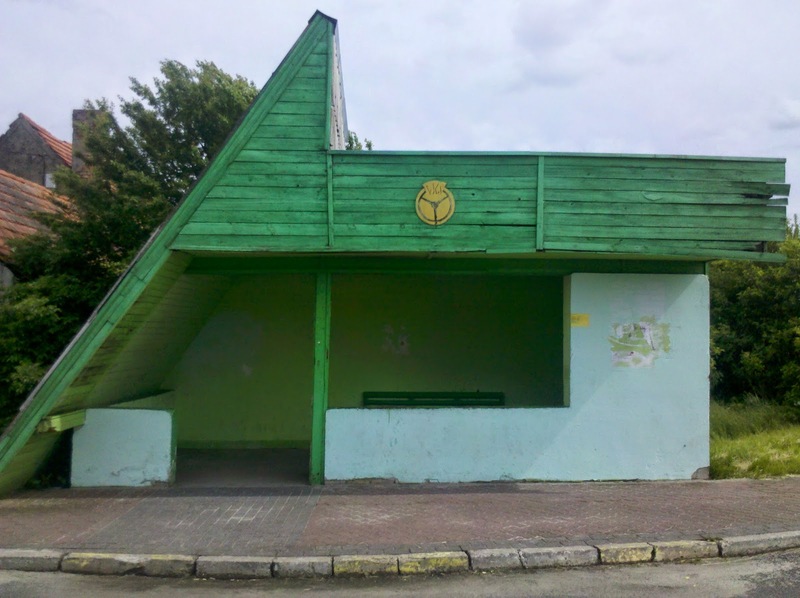 I grew a strong liking to the bus shelters along the road but I could not always make it to one in time. It is nice to cycle in the sun but mornings and nights are still pretty chilly. 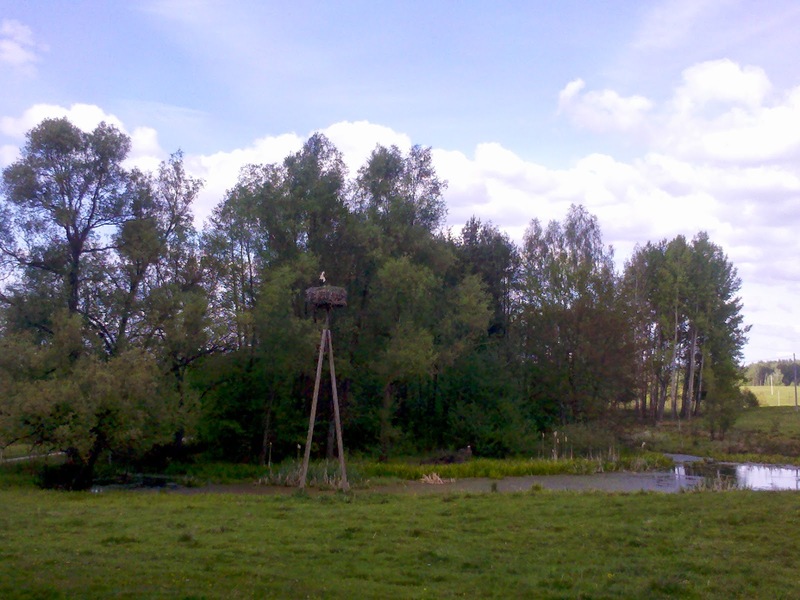 This region is also stork country! 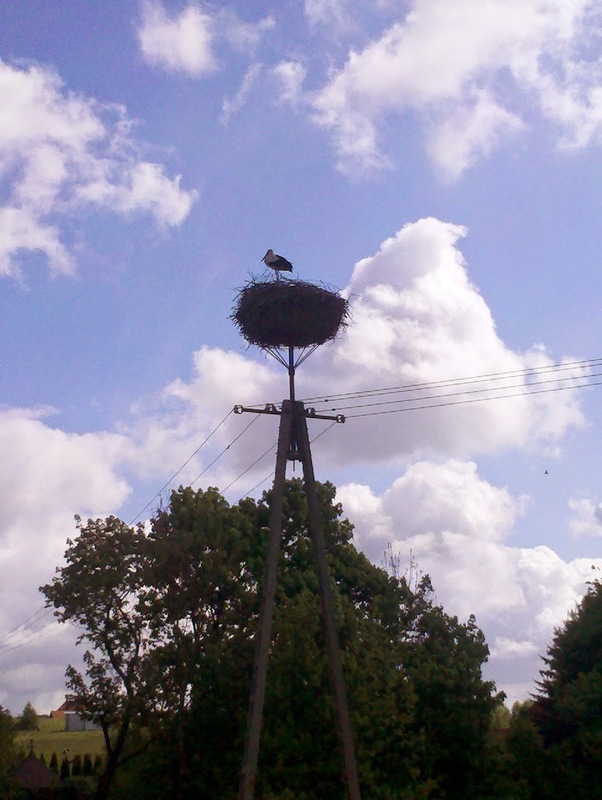 Huge stork nests are in every village and I can observe the huge birds mending their homes. Seems I am as migratory as the storks as I had last seen a huge stork population in Southern Spain this January at the end of my hike through Southern Europe. After cycling non stop for over a week I needed a break now. I was longing for a real shower, washing my hair and my clothes. 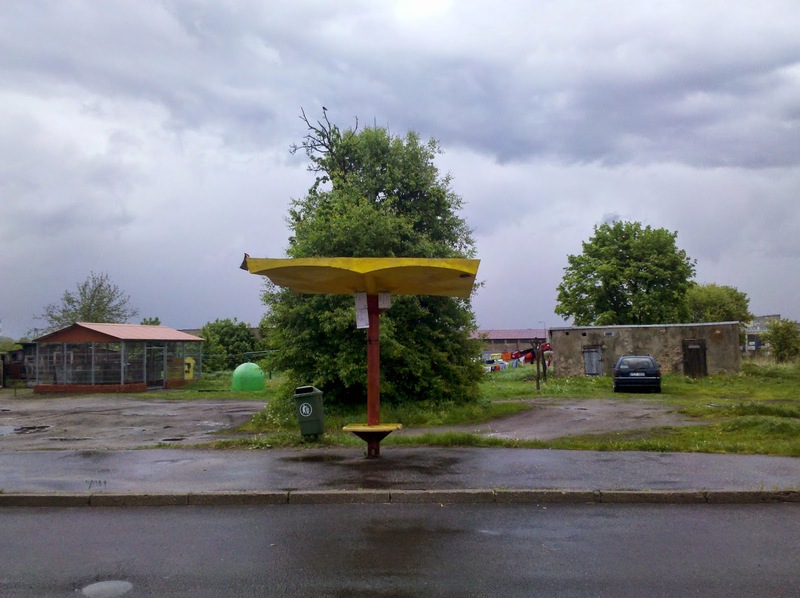 I decided on Olsztyn because my guidebook said it had a quiet campground. The campground was indeed so quiet that I could hardly find it. I asked a local and he talked 5 minutes to me in Polish which did not make me any wiser. And when I finally saw the first campground sign the dirt road leading to it was blocked by a fire brigade. Was the campground being evacuated? I started to worry... The solution was quiet less spectacular: this was a fire brigade school and they were just having a training session. Also caught in this road block was a German camper van and I asked them about the campground. In a friendly chat I learned that the campground was indeed open but nobody was there right now. "Just make yourself comfortable and the owner will arrive sooner or later." The campground itself was rather idyllic next to a lake but this being my first time on a Polish campground I was not prepared for the state of the sanitary installations. To make things worse the warm water had been turned off and my long awaited shower was a rather cold one. But soon I was clean and my clothes drying. I was just preparing lunch when the owner appeared who spoke fluent German. 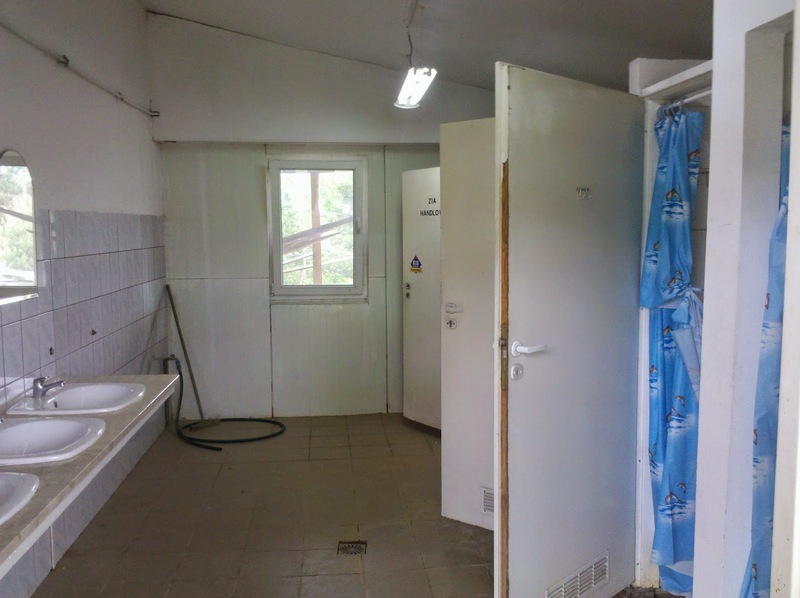 He apologized profusely for the lack of warm water but as he charged me only 20 PLN (5 €) I could not complain. 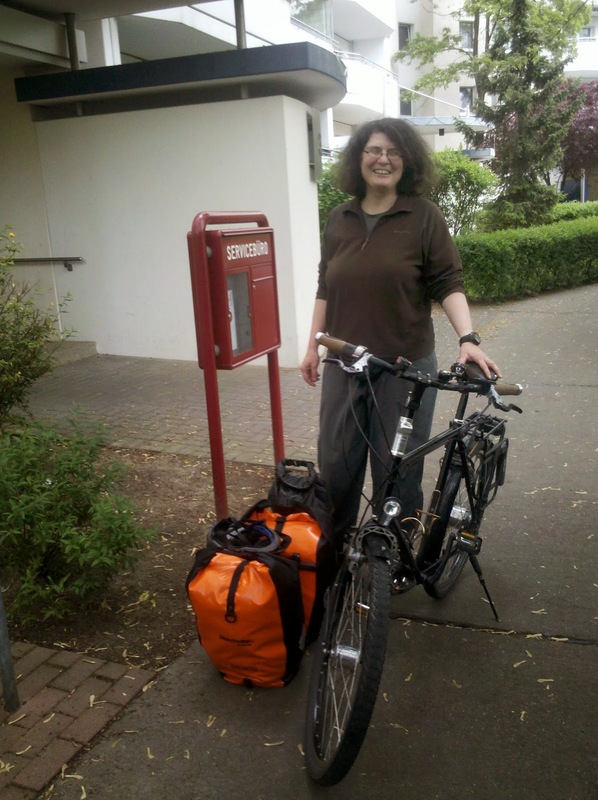 I pitched my tent and hopped on my bike to explore town without panniers and drybags. Now another surprise: After struggling with Polish roads for a week I found the perfect bike trail all the way into town. Well designed and brand new I was just flying into town! 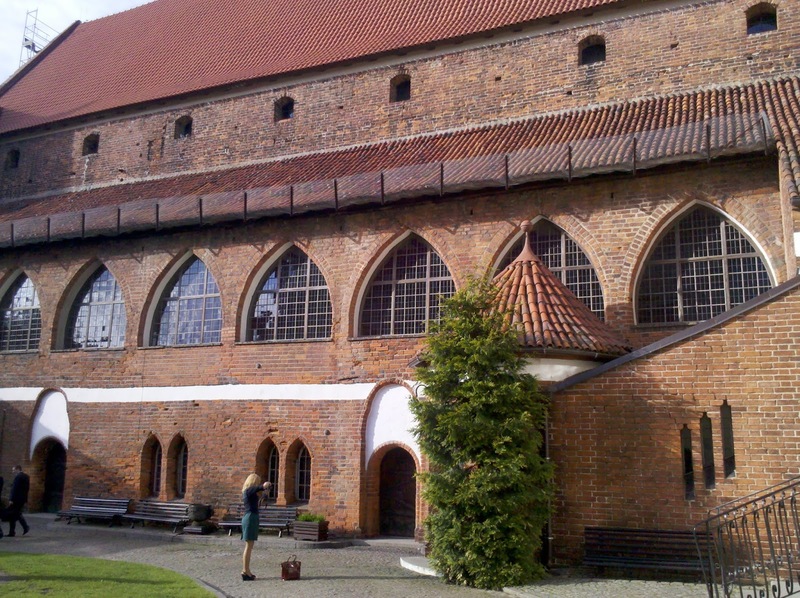 First stop was the old castle with its local museum that focuses on Nicolas Copernicus who had lived and worked here in Olsztyn. 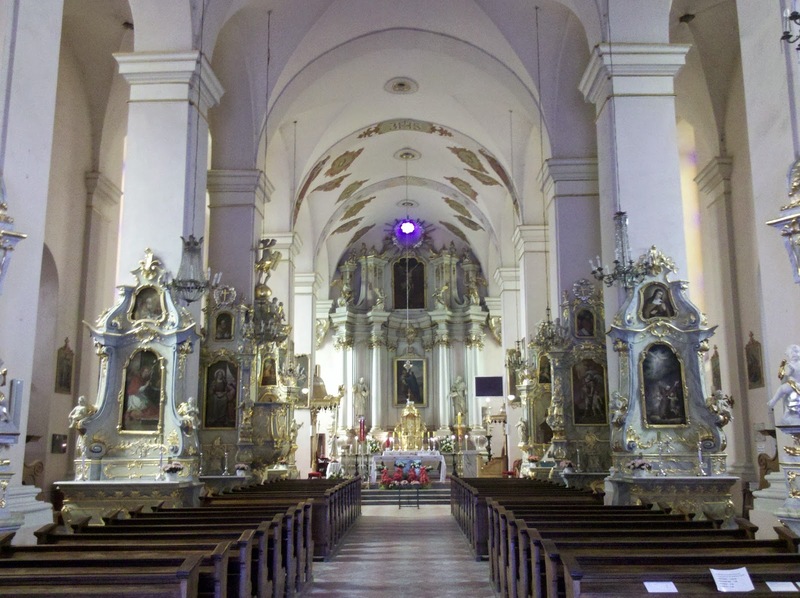 But more interesting than the museum was a visit to Olsztyn cathedral where I talked a long time with the church guardian. He was born in 1943 as the 13th child of a German family. His family story made the local history palpable. Olsztyn had survived the war relatively unharmed but was then burnt down by the Red Army. 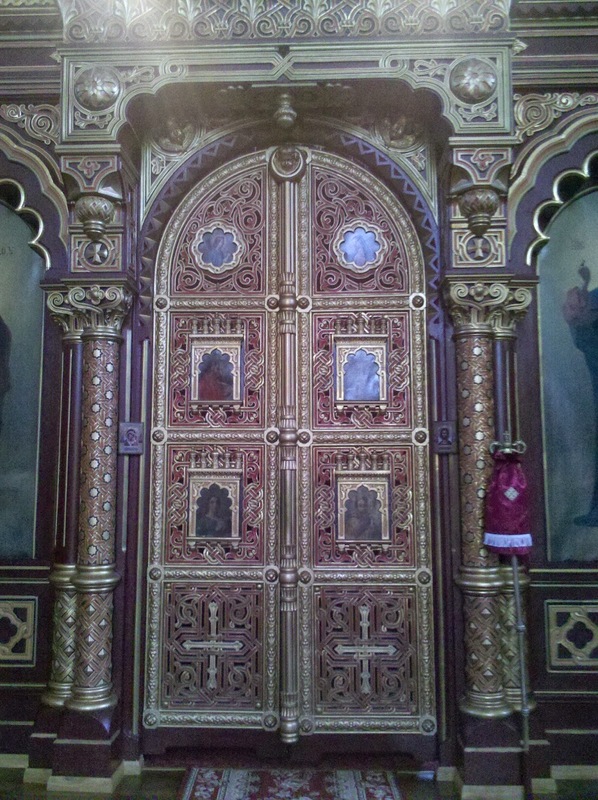 Only the churches were spared thanks to the initiative of a local priest who is now honoured with a memorial inside the cathedral. Like many local men his father was deported to Russia where he barely survived. Eventually most of the family stayed in Olsztyn and he married a Ukranian woman who had been deported by the Russians. (After most of the Germans had been expelled many Ukrainians were moved in by the Russians.) Luckily modern history in Olsztyn is not that sad: it is now a university town which might explain the many bike paths. Back at the campground the water was now lukewarm - and two more guests had arrived. I learnt from the campground owner who had formerly worked in Germany that most of his guests are Germans - more than Polish people. Before 1989 his campground was a popular meeting place for German families divided by the wall. East Germans could not go to West Germany but were allowed to visit Poland. So many family reunifications took place here. 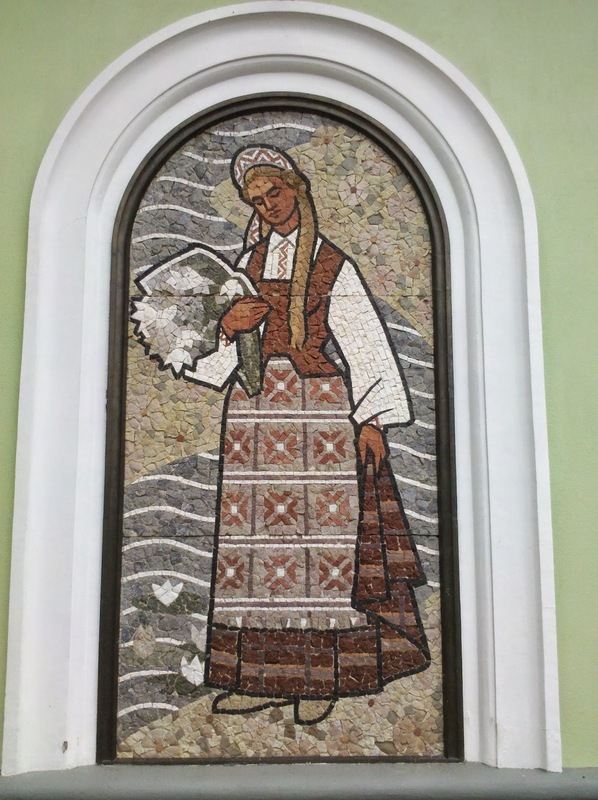 I have left the R1 now which continues through the Russian enclave of Kaliningrad to Lithuanua. Although this would have been the shortest route to the Baltic States I opted not to take it. It would have been too much hassle and too expensive to obtain a Russian visa. Instead I turned off the R1 East now until I can cross directly from Poland into Lithuania. And as both countries are members of the EU the border crossing will not involve any bureaucratic hassle. I have cycled almost the entire R1 through Poland. The whole R1 connects Calais in France with St. Petersburg in Russia. 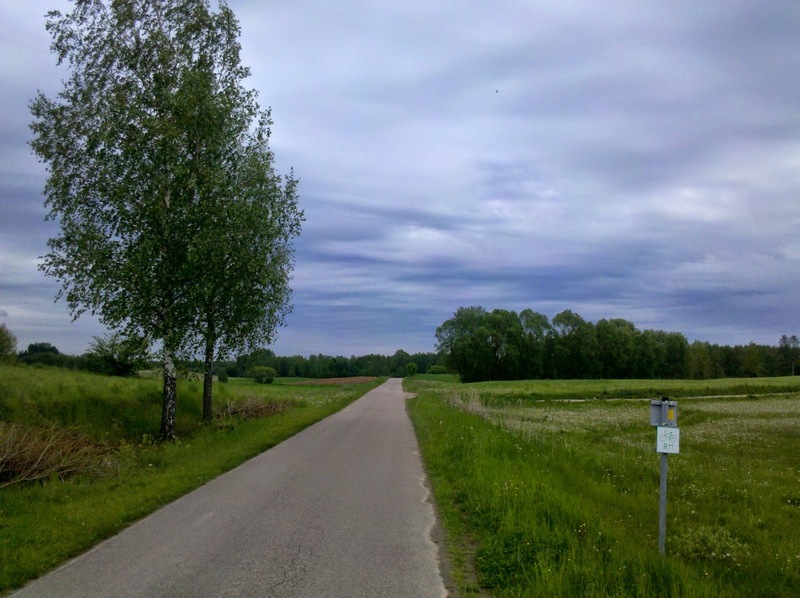 I chose an existing long distance bike trail because usually these routes are great for sightseeing, go through interesting landscape and most importantly avoid dangerous road sections. I say "usually" because unfortunately the R1 has been a disappointment in all three aspects. I have not made a single longer sightseeing stop - basically because there has been not much to sightsee... 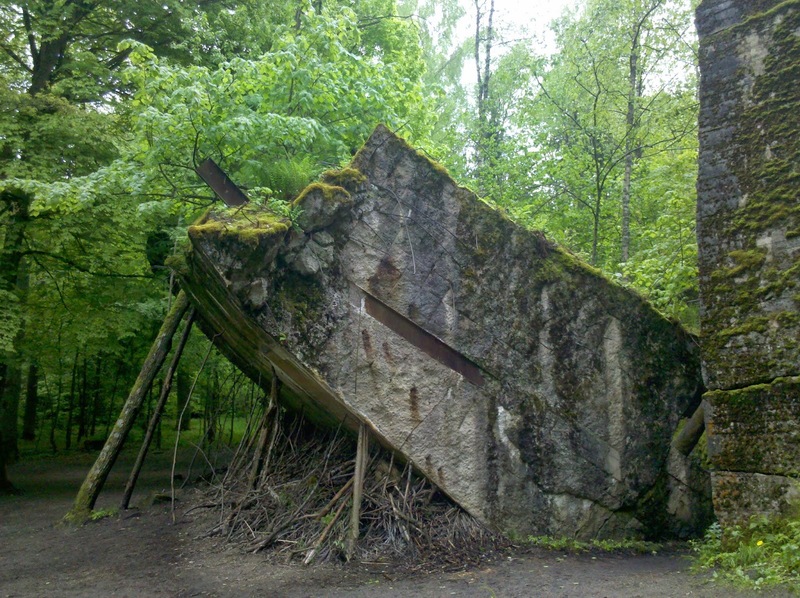 The towns and villages along the route have either been destroyed during WW II or afterwards by the Red Army. 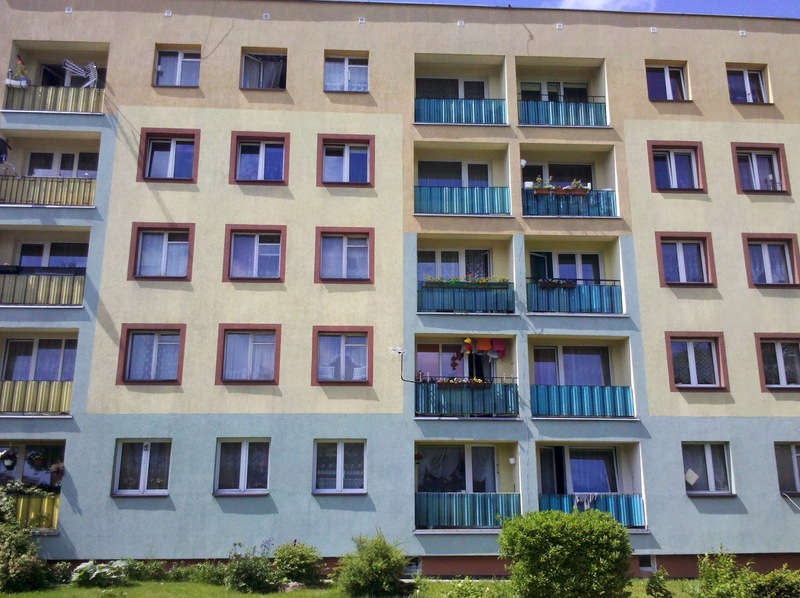 So mostly I have seen a lot of drab housing complexes in a rather shabby state. 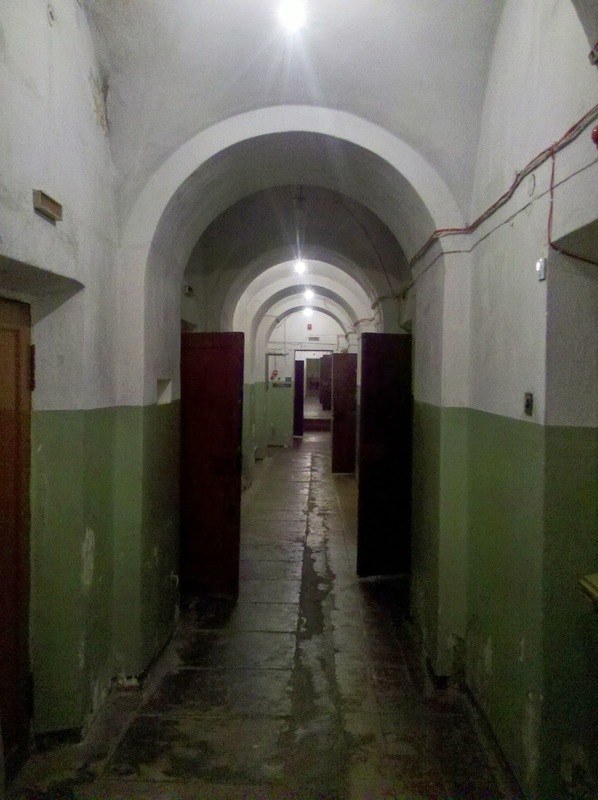 Sometimes some old remaining buildings have been renovated but these historical sights look strangely out of place in the post-communist surroundings. The R1 passes through Grudiaz (formerly Graudenz) which is a prime example. 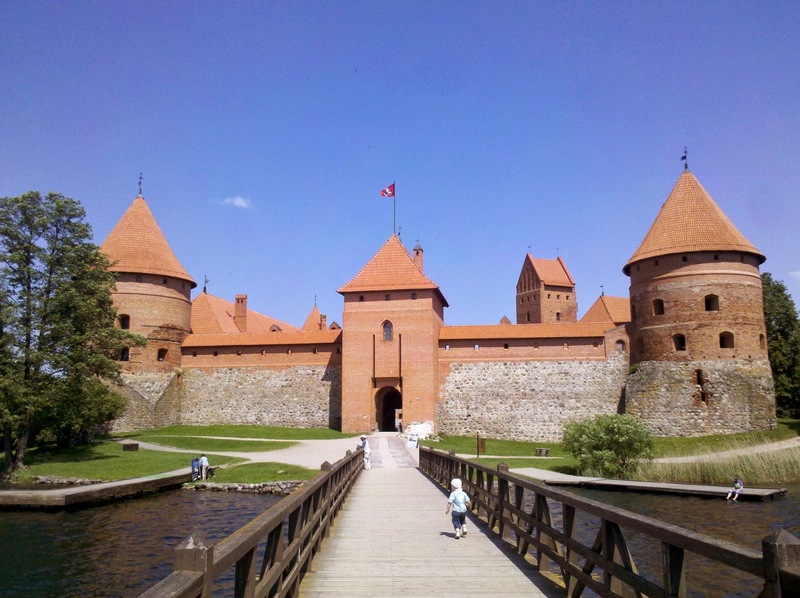 The old castle complex has been renovated and was teeming with people on a sunny Sunday afternoon. But in order to get into and out of town the R1 follows endless rows of depressing housing complexes teeming with people that sometimes even looked rather scary. 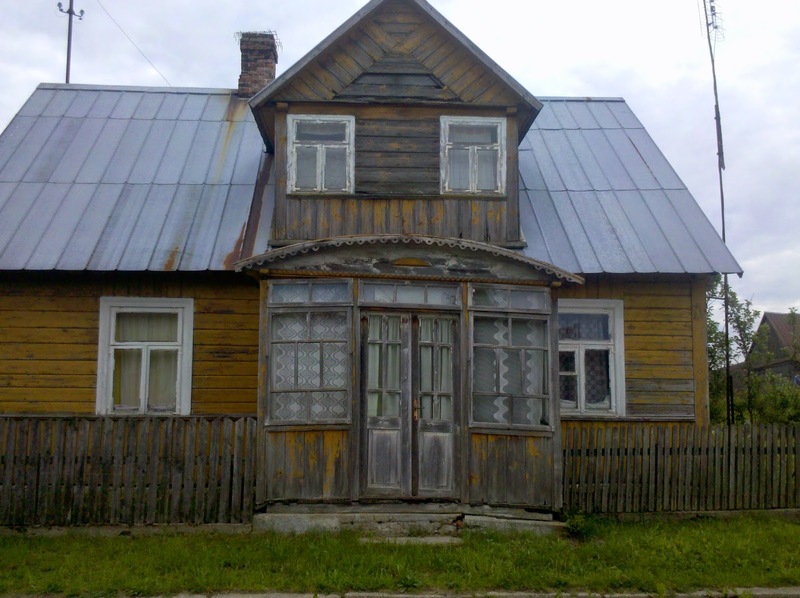 Very few pre WW II houses were left and they looked so bad that I was surprised that people were still allowed to live in there. But the biggest disappointment is the road itself. The R1 is often routed on rather heavily trafficked roads with no shoulder - not to mention a bike lane. To make things worse the roads are often in an incredibly bad shape. All not very satisfying for an international long distance bike trail. To sum it up: the R1 in Poland is definitely not a recommendation. From my point of view there were only two good aspects: the R1 surprisingly well marked - and stealth camping has been easy. This trip started like all my trips start: I was incredibly nervous and had another hypochondriac attack. This time it was my ear again. Yes, the same ear that had already been bothering me in Spain. I had contracted a very stubborn ear infection that came flaming up again and again. I was constantly seeing a doctor and although she had declared my ear healthy again it kept hurting - especially the days before I left. The day I was supposed to leave I woke up at 3 am and could not fall asleep again. I was especially worried that my ear infection was flaming up again - and therefore I was the first morning patient at my doctor's. But luckily I was just suffering from the aftermath of my ear infection - or a hypochondriac attack. My ear looked fine and I was declared fit for travel. The next step was much easier: I had to hand over the keys of the apartment. I had spent the whole previous day cleaning the place and had strangely enough even enjoyed these housewifely duties. So finally at midday I was ready to leave and of course the first day was full of obstacles. First I had to load the bicycle which took a while because I am out of routine. Then I discovered that my bike computer was not working. It took me an hour and changing batteries until it dawned on me that I just had to change its position to make it work properly. Meanwhile my GPS routed me out of Berlin in the most convoluted way. As soon as I had left the vast suburbs behind I had to take a break and eat something - only to discover that the water out of my bike bottle tasted horrible. I wondered with what I had cleaned it - or what chemical was poisoning me now. Rinsing it out several times solved the problem eventually. Soon I was exhausted and tired which did not come as a surprise. I had only slept three hours and was hopelessly out of shape after three months of doing nothing. After 60 km I called it a day and started looking for a tick free campsite and was soon lucky. I found a nice dry spot under pine trees and set up my tent. Everything took forever as I still have to settle into a routine with this setup. I passed out at 9 pm and did not wake up before 8 am after a very good night's sleep. It had been a cold night and fighting with drybags and panniers it was after 10 am when I left - not exactly an early start... But I don't want to overdo it. My body was aching a bit and I had even gotten a bit sunburnt. I stopped at a bakery and treated myself with two pieces of cake as a second breakfast. Soon I arrived at the river Oder which forms the border between Germany and Poland. 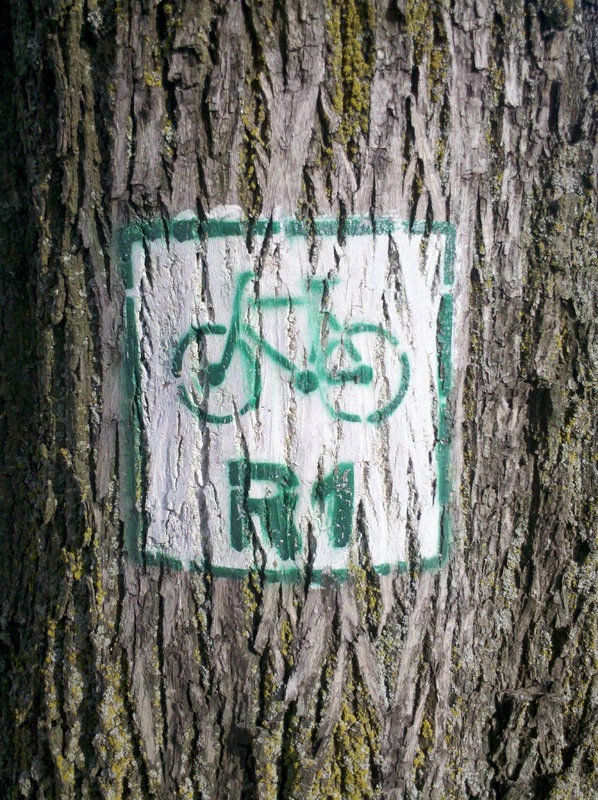 I am cycling the bike route R1 now which will lead me through almost all of Poland. The R1 follows the Oder for a bit which is a nice stretch on top of dykes with great views onto the Oder flood plains. At Küstrin I crossed into Poland - and immediately used the chance to visit one of my beloved Lidl supermarkets. I even changed money instead of using an ATM because I wanted to have small change for the Lidl shopping carts. I should not have worried about that little detail. As Kosztrin is a cheap and quick shopping destination for Germans you could do anything with Euros. The shopping carts take zloty and Euro and you can even pay with Euro cash at Lidl. Of course I had to compare the German Lidl product range with the Polish one. Unfortunately cooking instructions on a lot of Polish products are in Polish only leaving me clueless but I got my dinner shopping done. The R1 started with a horrible stretch of highway cycling in Poland. 11 km on a narrow highway with no shoulder or bike lane. A bad introduction to Polish drivers who do not seem to brake for cyclists... 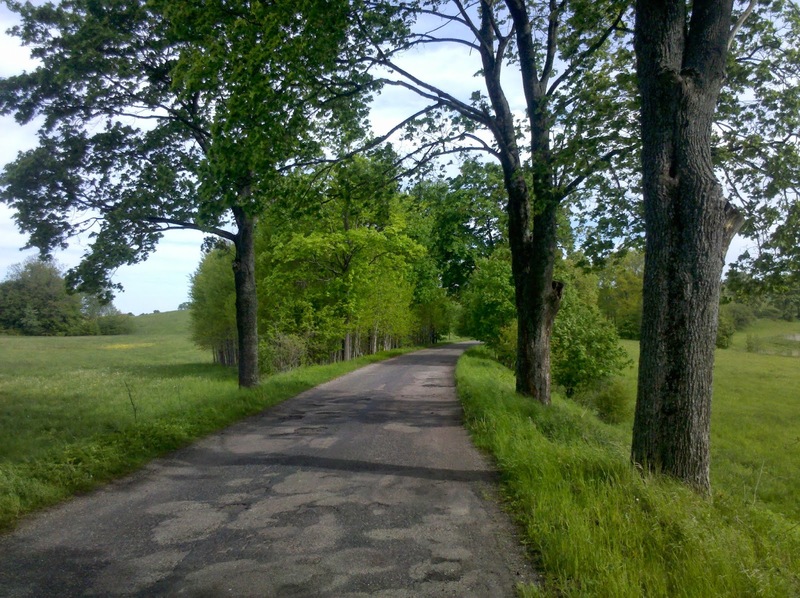 I was relieved when I turned off the main highway onto a quiet country road. Although I had just cycled 60 km I was already tired. The area was nicely forested and I decided to turn off the road and look for a campsite. A signpost led me onto a dirt road - and to a nice sandy beach and lake. What a nice surprise! The water was too cold for a proper swim but I could wash up nicely. The feeling of cleaning up before hitting the sack is just great. The beach was part of a free official campsite but the place was rather dirty and looked well visited. Being on my own I rather stealth camp and soon found a good invisible site - where I was soon lying in my tent listening to the raindrops..... and falling asleep. Next morning I was awoken by loud chain saw noise. I had been sleeping so well that I had not heard that a whole troop of forest workers had parked their cars just 200 m away from me and where now busy felling trees - luckily on the other side of the forest road. I was so well hidden that I first had a hearty porridge breakfast before I departed. Later that day a big mishap happened. I wanted to take a rest and sat down on a metal road barrier. When studying my maps I suddenly realised that my whole shirt sleeve was dirty. Being surprised I tried to brush the dirt off when I discovered what had happened: Someone had greased the road barrier and I had brushed off the grease. OMG, how would I ever be able to get these stains out of my light coloured shirt. I tried to clean it as best as I could with leaves and then set off in search of a water faucet. A local cemetery came in handy. Luckily I carry soap on bike trips and I started scrubbing. I almost wanted to despair when after 10 minutes of hard work the grease stains started to vanish. More vigorous scrubbing and my shirt looked almost new. I was relieved that I didn't need to buy a new shirt and set off cycling again. On this third day I cycled 85 km and I seem to get slowly into shape. Free camping has been easy so far as there is plenty of forest everywhere. But this is about the only good news about cycling in Poland. The little towns I have passed through that far are rather desolate with the typical run down housing complexes. The R1 itself had been rather disappointing in Poland as well. 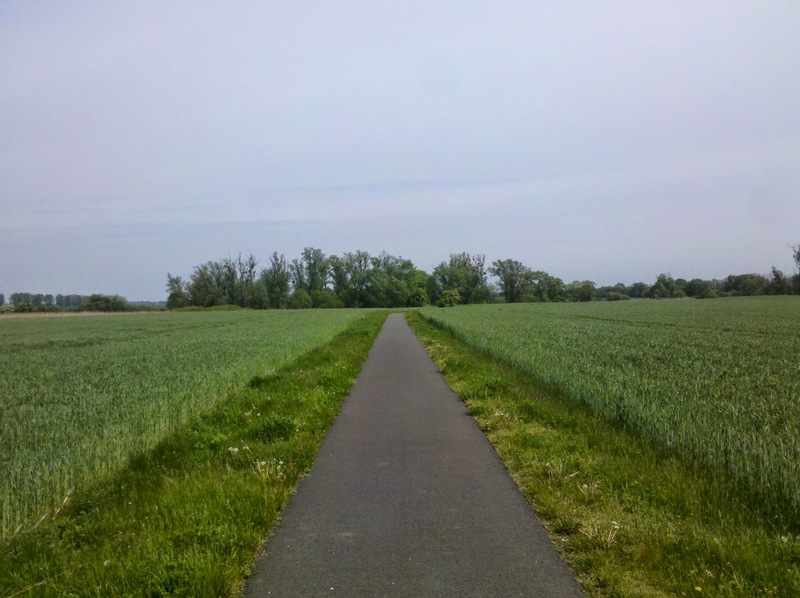 On the short 100 km stretch in Germany I was almost exclusively on bike trails or even bike roads. Here in Poland the R1 is almost exclusively in busy roads with no bike trail and not even a shoulder. Traffic is fast with a lot of (lumber trucks) and the roads are in a horrible state with potholes and badly repaired bits. The truck drivers are mostly ok and stop if necessary but I always hold my breath if a truck overtakes me. I do hope that the R1 route improves - so far it has definitely not been recommendable. 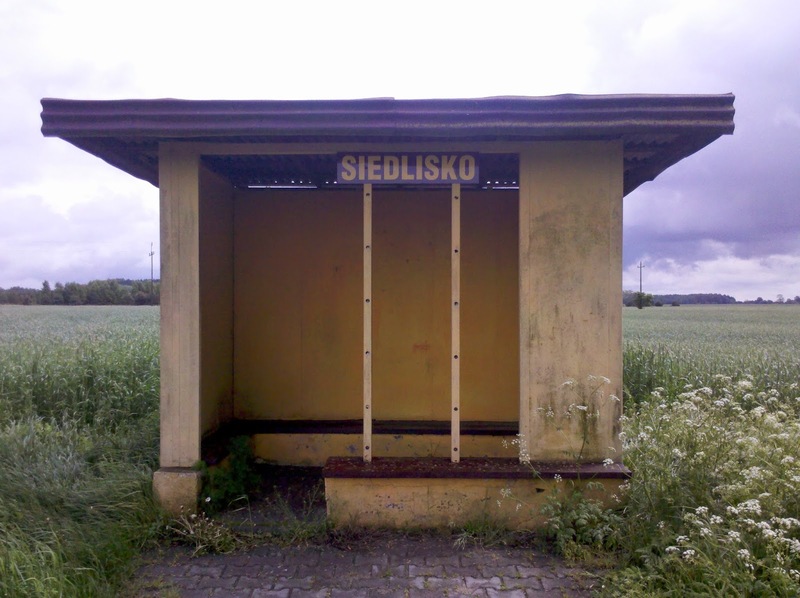 And in case you were wondering: Yes, I have developped sort of an obsession with bus shelters.